Automatic doors come in a variety of styles and models. The doors can be seen in every building and business premises in all its shapes, sizes, and styles. Businesses ranging from hospitals, schools, malls, private business, and public buildings. You are spoilt for choice when it comes to finishes for your choice of automatic doors. Automatic doors are made with the highest quality of finishes and products. 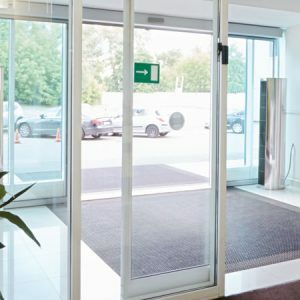 Automatic door manufacturers can use these products and finishes to make a door to your unique requirements and building entrance. Using an independent automatic door manufacturer means you are guaranteed of getting a door that is perfectly suited to your needs. Independent manufacturers are not beholden to one product or manufacturer and will give you the best possible product for your building entrance. Independent manufacturers rely on their reputation and will gladly supply you with references on previous work to give you peace of mind about the quality of work they produce. Also, shopping around for an independent manufacturer allows you to get the best possible price for the automatic door of your choice. It does not matter what sector your business operates in; there are a variety of automatic doors to suit your individual needs. And there are a variety of options to choose from such as telescopic doors, sliding doors, and swinging doors. The advantages of choosing an automatic door are two-fold. Firstly, an automatic door will ensure that your building adheres to the Disability Discrimination Act, as well as other stringent health and safety requirements. Automatic doors allow for ease of access and mobility to your building and business. Secondly, entrances with automatic doors are becoming the industry standard for buildings. Automatic doors are aesthetically pleasing and create a lasting first impression to all visitors to your business premises or building. Also, the finishes and trims available will match and complement any architectural design and modern building façade. First impressions last, and you will certainly strike the right chord with a stylish, modern and safe automatic door. You can start communicating your professionalism and trustworthiness the second your client walks through the door. Automatic sliding doors are seen almost everywhere. The sliding door is aesthetically pleasing and creates a welcoming and easy access to any building. The automatic sliding door can be used in any building and are popular with businesses such as hospitals and supermarkets. The popularity of the sliding door is due to its ability to create wide openings that allow for moving trollies, wheelchairs and hospital beds. The automatic swing door comes in many varieties. The automatic swing door is very versatile in that the doors can be installed in existing door structures. The swing door in can installed in a single or double-leaf configuration. The doors are available in low-energy and automatic models. Elements such as width, speed, weight and force that is needed to open the doors must be taken into consideration. Automatic revolving doors are perfect for malls and stores as the doors are designed to handle large and continuous foot traffic. Many hotels, shopping centers, and office blocks are now using automatic revolving doors. Reception employees benefit greatly from automatic revolving doors as they are not greeted by severe weather conditions, cold or wind everytime the doors of the premises are opened. Apart from its extremely trendy appearance, the folding door is ideal when space is tight but quick and easy access is necessary. This model is easily integrated into most entrances, and can be fitted both in front of an opening as well as between 2 side walls. Perfect solution to keep the cost of building as low as possible. We offers specialized crews with the innate ability to provide handicap door opener service, from repairs to installation. Whether you need a simple handicap door with a commercial handicap door opener, or a more complex design that features handicap automatic door openers. Accessible washroom standards have been around for many years. Some of the common features include requirements for easy to operate doors and locks. When properly designed and implemented, an accessible washroom locking system is easy and intuitive to use for everyone. We are based in Markham just outside Toronto but most of work throughout GTA areas. We have engineers working on automatic doors throughout every corner of Mississauga, Scarborough & NewMarket. If your company is based in Toronto then our dedicated team of aluminium door & automatic door maintenance experts are on hand to service your needs 7 days a week throughout every corner of Toronto. Yes we can, BBG Maintenance provide maintenance agreements with many commercial customers to cover their automatic doors, manual doors, windows, doors and other industrial security needs. We have specific service level agreements in place to cover businesses from vandalism, breaks and general faults. This can also help lower your business insurance too. Yes, we can work on any type of automatic doors available in Toronto from automatic sliding doors to bi parting double doors. We also repair all types of manual doors and industrial security doors and windows. Automatic telescopic doors are popular at building with very high foot traffic. The telescopic door gives you a solution to a specific issue. Many different types of building and companies are using the automatic telescopic door. The automatic telescopic door offers you a sophisticated, stylish, and smart solution to an entry system for your building or company. It is advised to hire an independent company to manufacture and install your automatic door. Choosing an independent company means the company will provide a door that meets your every need and will not only sell a brand that they are contractually committed. The freedom to plan, design, manufacture and install a door of your choice will mean you will have an automatic door that you are satisfied with over the long-term. Independent companies have a far great amount of freedom to design and install an automatic door to your exact requirements. Companies that are contract-free can approach your project on your terms and stipulations, as well as create accessories and products that are best suited for your exact requirements. Obligation-free companies rely on previous customer satisfaction to establish their reputation. The independent company means you are guaranteed to working with a company that is well-established in knowledge, experience, and design. The independent company can create an automatic door for openings that are large or narrow. Previous satisfied customers are key to choosing the correct partner for your access needs. An independent company will be happy to supply references to work done. It is always advisable to have a single company plan, design, manufacture and install your automatic door. This way, you are guaranteed of quality and to meet all safety and health requirements. A single manufacturer and installer will ensure that your every need is met. Also, most companies that install and manufacture automatic doors will issue warranties and maintenance contracts with the doors. Investing in the proper automatic door best suited for your building and entrance façade will mean you have many years of peace of mind and great access to your business.